Optimized for peak performance, the Android-powered Samsung Galaxy S III from Sprint offers one of the most sophisticated interactive mobile experiences to date. You'll be able to send photos, videos, and information easier and faster than ever while staying in close connection to friends and family members from wherever you are. 8-megapixel camera with burst mode and Full HD 1080p video capture (see larger image). The Galaxy S III runs the Android 4.0 operating system (a.k.a., Ice Cream Sandwich), bringing a redesigned user interface with enhanced multitasking, notifications, full Web browsing experience, and more. You'll also enjoy innovative, next-gen features such as Face Unlock, which uses facial recognition to unlock the Galaxy S III, and Near Field Communications (NFC) capabilities. Going beyond simple point-and-shoot photography, the 8-megapixel rear camera offers a Burst Shot mode that captures still pictures at a rapid-fire pace at three images per second with zero shutter lag, and its Best Shot feature recommends the best picture to keep based on colors, lighting, and clarity. It also records Full HD 1080p video with a backside illuminated sensor that improves performance in low light environments--and you can even capture a photo while shooting video. Note: The Galaxy S III is able to access the Sprint 4G LTE network, available in limited markets. 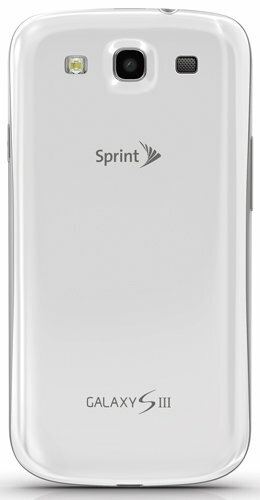 This phone is also compatible with Sprint's nationwide 3G network. 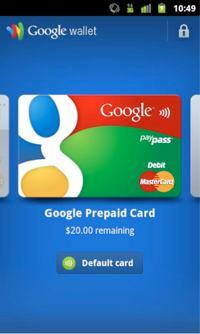 With Google Wallet, you can transform the Galaxy S III smartphone into a smart wallet using Near Field Communication (NFC) to make safe purchases at more than 100,000 participating retailers--including Bloomingdales, Toys "R" Us, CVS, Gap and Macy's. The Galaxy S III has enhanced features that both you and your contacts will enjoy. It's designed to make sharing easy and more direct so your friends and family can experience every moment with you, regardless of your location. Connect Through Touch: With S Beam, just place two Galaxy S III phones back-to-back and you can transfer photos, videos, documents, and more. In just three minutes you can successfully share a 1 GB video file--it's fast, easy, and you don't even need a Wi-Fi or cellular signal. Let Your Eyes Control the Display: Thanks to the Smart Stay feature, the screen display will remain bright as long as you're looking at the phone. Set it down, and it dims instantly. Because the front-facing camera can identify your eyes--while reading an e-book or browsing the web, for instance--it recognizes how you are using your phone and provides a bright display accordingly. Don't Miss a Message: If you've been away from your phone, the Smart Alert feature will give you a vibrating nudge to let you know about missed calls and messages. The Samsung Galaxy S III weighs 4.7 ounces and measures 5.4 x 2.8 x 0.3 inches. Its 2100 mAh lithium-ion battery is rated at up to 9.2 hours of talk time. It runs on Sprint's 3G (800/1900 CDMA/EV-DO Rev. A frequencies). Sprint's 4G LTE network is available in limited markets. A short-range wireless technology similar to Bluetooth, Near Field Communication (or NFC) allows enabled devices to share information in close proximity. For example, you can "touch" or "swipe" an NFC tag that might be embedded in a poster, sticker, or advertisement, then act on the data read from the tag. Wireless-N Wi-Fi networking (802.11b/g) for accessing home and corporate networks as well as hotspots while on the go. microSD card slot with support for optional cards up to 64 GB. This device has been extensively tested, is fully functional, and ready for activation. Freedom Pop is the nationâ€™s first 100% FREE mobile phone service with free voice, text and data. Make free calls and send texts over Wi-Fi or using our blazing-fast 4G LTE network. With no contracts or cancellation fees you can choose from a variety of flexible and affordable prepaid plans. Youâ€™ll be able to pay for only what you need even if it changes from month to month. The Motorola Moto E is Freedom Pop's newest LTE capable Android smartphone with powerful processing and a built-to-last design. It brings all the benefits of the world's most popular mobile OS and blazing fast LTE speeds at a reasonable price. With Corning Gorilla Glass and a water-resistant splash guard the Moto E will survive all of lifeâ€™s crazy adventures while the long-lasting 2390 mAh battery will keep you connected all day long. The Samsung Galaxy S III is a very capable Android smartphone featuring 4G LTE speeds, 1.5GHz dual-core S4 processor, a gorgeous Super AMOLED 4.8-inch display, and an 8-megapixel camera capable of recording HD video and still images simultaneously. The S3 is also equipped with NFC technology, 16 GB built-in memory, microSD slot for additional storage, multi-format music player, WiFi, and GPS. This device offers access to thousands of apps, games, movies, books, and music on the Google Play Store. The Samsung Galaxy S 4 is thinner and lighter than the S III, yet it packs a larger 5-inch Super AMOLED display, with durable Gorilla Glass 3. Other improvements include a faster 1.9GHz quad-core processor, 13-megapixel camera, super-sensitive touch screen, and infrared universal remote control. The S4 can also detect hand gestures over the display and comes equipped with 16GB internal memory, and a microSD memory card slot for additional storage. Other features of this device include LTE high-speed data, 2-megapixel front camera, removable battery, and quadband GSM along with WCDMA modes for international use. Use this device to access thousands of apps, games, movies, books, and music on Google's Play Store. 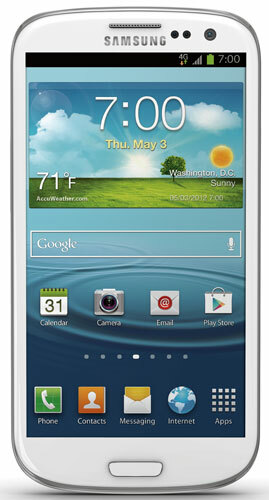 Top Level Categories for Samsung Galaxy S III, White 16GB (Sprint).